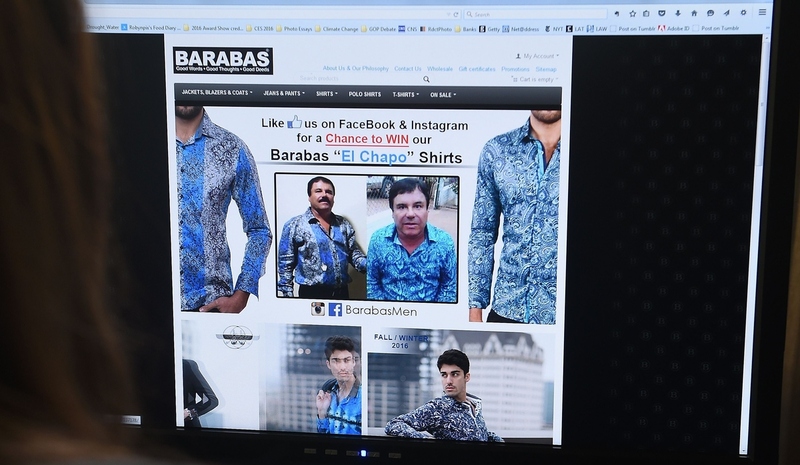 You, Too, Can Dress Like 'El Chapo' : The Two-Way A Los Angeles-based clothing company has identified Joaquin Guzmán's flashy shirt, as seen in his photo with actor Sean Penn, as one of its own — and it's seizing the moment of fame with a splashy ad. A woman looks at the home page of the clothing house Barabas on Tuesday. At the time, the site featured two photos of Mexican drug kingpin Joaquin "El Chapo" Guzmán. Today the site shows a different ad — one that, again, stars El Chapo. But from one quarter, at least, there was pure excitement. "EL CHAPO GUZMAN WEARING BARABAS SHIRT !" was the all-caps announcement from the clothing company Barabas. The Los Angeles-based clothier says Rolling Stone photos show the drug kingpin wearing its distinctive shirts. And the company has seized the moment. Today, if you head to its home page, you'll see its name, its slogan — "Good Words, Good Thoughts, Good Deeds" — and a gigantic ad pairing pictures of El Chapo and a Barabas model. You wouldn't mistake the mustachioed druglord for the bearded, coiffed model. But their shirts are distinctly similar. Sean Penn writes that when he met El Chapo, the druglord wore "a casual patterned silk shirt." According to Barabas, it was actually cotton. Barabas identifies it as from the "Fantasy" line and suggests the shirt's pattern is "simple, clean and works well together." We'll leave that to you to judge. The clothing company claims that another shirt — one worn by El Chapo, sans mustache, in a video sent to Penn — is also one of theirs. It appears to resemble the Barabas "Crazy Paisley" style. If you want to channel El Chapo's look, each shirt will set you back $128. At one point, the Barabas site crashed under high traffic, the company says. But it's back up and running now. Barabas says in its "philosophy of fashion statement" that it's an "environmentally and socially responsible company," committed to the good words, good thoughts and good deeds of its motto. The company has not commented on the quality of El Chapo's words, thoughts or deeds.